The Larkin Community Cookbook by Deidre Dalton is now available in Kindle, Kobo and Nook editions, and as a PDF (Adobe Acrobat) download. The cookbook is a compilation of more than forty recipes mentioned or prepared by characters in the fictional epic known as the Collective Obsessions Saga. The eight-part series of fiction novels chronicles the extraordinary loves and intricate obsessions between two families sweeping a span of more than one hundred years, all set against the backdrop of a Gothic seaside mansion in Maine. The diabolical Amber Whale executive chef Jack Sansovino is also a dab hand in the kitchen, where he brews more than just seafood specialties. Various members of the Larkin family have culinary talent as well, including Shannon, Derek and Dana, who prepare mouth-watering dishes for family and friends. Derek also becomes a professional chef and opens his own elegant restaurant in Larkin City, known as The Silver Tassel. Before her grisly demise, Carly O'Reilly whips up delectable dishes for her highly successful Harbor View Catering Company, where she also sells homemade foodstuffs. The e-cookbook was edited by Food Fare, with cover art by Webs Divine. 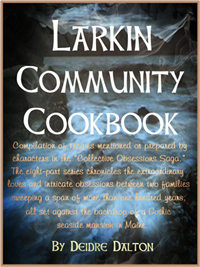 The Larkin Community Cookbook is available in Kindle, Kobo and Nook editions, and as a PDF (Adobe Acrobat) download. Select your preference and get cooking! Take a look inside the Larkin Community Cookbook with our exclusive screenshots. See a complete list of recipes in the Larkin Community Cookbook and view free samples.